So, those alcohol gels like purell have been a usefull (and somewhat obsessive) tool up to now. But ever since the Obama Fist Bump & Swine Flu people are freakin-out about shaking someone else's hand. So, what does one do? 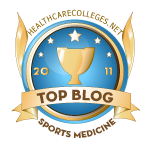 While in SanDiego California for the American Chiropractic Board of Sports Physicians annual symposium, myself along with a privileged few other doctors traveled across town to the USA Judo tournament I found a sponsored vendor named Athletic Body Care. After speaking with them for a few minutes I realized that this was something I needed to keep in my sports medicine bag, at my office and probably a bottle in my car. 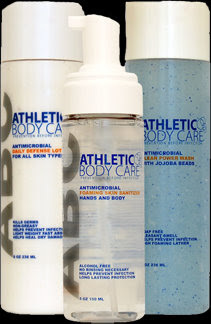 Athletic Body Care makes 3 products, a "hand sanitizer" type liquid, a "daily defense lotion" and a shower gel. What the heck, I bought all 3. The nice thing about this stuff is it kills microbes and its effectiveness doesn't wear off when it's dried up....it's effective at killing microbes for up to 1-hour. 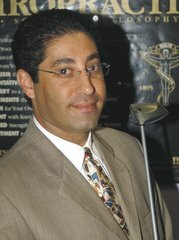 So, if you're a sports medicine physician out in the field, networking at a business meeting or you're kids are going to a friends birthday party, you should consider arming yourself against the H1N1 or other "nasties" that travel via hand to hand, hand to doorknob or other nasty hand to ??? contact may be. Check out Athletic Body Care's products at http://www.athleticbodycare.com/ They cost abot $10-12 bucks each. Well worth the price of protection.